CAT 2016 results were declared today and a common question has been what sort of score would have lead to what percentile. For CAT 2015 we had compiled a list with the help of our students and some other CAT aspirants who sent us their scorecards. We are working on the same for this year as well. We will release all this information in public domain and hopefully it would help future CAT aspirants make a better judgement. If you want to contribute to this list, please email your scorecard to [email protected]. Clearly, CAT 2016 was significantly tougher than CAT 2015. Another important point to note is that Verbal Aptitude and Reading Comprehension section was significantly easier than Logical Reasoning and Data Interpretation whereas Quantitative Aptitude was moderate. Another interesting point to note was that the Logical Reasoning and Data Interpretation section was so hard that if you did not attempt a single question – you would have still got 22 percentile and just doing 3 questions would have taken you above 50 percentile. Let that sink in! Approximately 44000 students scored negative in the Logical Reasoning and Data Interpretation section. Approximately 1 Lakh students were not able to solve 3 out of 32 questions in 1 hour. In my personal opinion, it is extremely unfair to have such disparity between sections. It is absolutely OK if all sections are tough. It is absolutely OK if all sections are easy but such sort of variation leads to favoring a particular type of candidate and dishearten another type. At the end of the day, the CAT exam is there to select the best students. I do not think that such sort of a paper does justice to that goal. A scaled score of 83.09 marks in CAT 2016 would mean an overall 80.31 percentile. A scaled score of 83.33 marks in CAT 2016 would mean an overall 80.44 percentile. A scaled score of 83.74 marks in CAT 2016 would mean an overall 80.67 percentile. A scaled score of 84.8 marks in CAT 2016 would mean an overall 81.27 percentile. A scaled score of 84.82 marks in CAT 2016 would mean an overall 81.28 percentile. A scaled score of 85.22 marks in CAT 2016 would mean an overall 81.5 percentile. A scaled score of 85.41 marks in CAT 2016 would mean an overall 81.59 percentile. A scaled score of 85.47 marks in CAT 2016 would mean an overall 81.63 percentile. A scaled score of 85.69 marks in CAT 2016 would mean an overall 81.74 percentile. A scaled score of 85.97 marks in CAT 2016 would mean an overall 81.9 percentile. A scaled score of 85.99 marks in CAT 2016 would mean an overall 81.91 percentile. A scaled score of 86.75 marks in CAT 2016 would mean an overall 82.32 percentile. A scaled score of 86.76 marks in CAT 2016 would mean an overall 82.32 percentile. A scaled score of 87.18 marks in CAT 2016 would mean an overall 82.5 percentile. A scaled score of 87.95 marks in CAT 2016 would mean an overall 82.94 percentile. A scaled score of 88.55 marks in CAT 2016 would mean an overall 83.22 percentile. A scaled score of 88.9 marks in CAT 2016 would mean an overall 83.4 percentile. A scaled score of 89.07 marks in CAT 2016 would mean an overall 83.48 percentile. A scaled score of 89.31 marks in CAT 2016 would mean an overall 83.59 percentile. A scaled score of 89.34 marks in CAT 2016 would mean an overall 83.6 percentile. A scaled score of 89.54 marks in CAT 2016 would mean an overall 83.7 percentile. A scaled score of 89.61 marks in CAT 2016 would mean an overall 83.73 percentile. A scaled score of 91.5 marks in CAT 2016 would mean an overall 84.67 percentile. A scaled score of 91.92 marks in CAT 2016 would mean an overall 84.88 percentile. A scaled score of 92.35 marks in CAT 2016 would mean an overall 85.08 percentile. A scaled score of 93.49 marks in CAT 2016 would mean an overall 85.6 percentile. A scaled score of 94.05 marks in CAT 2016 would mean an overall 85.84 percentile. A scaled score of 94.17 marks in CAT 2016 would mean an overall 85.9 percentile. A scaled score of 94.61 marks in CAT 2016 would mean an overall 86.1 percentile. A scaled score of 94.64 marks in CAT 2016 would mean an overall 86.11 percentile. A scaled score of 94.93 marks in CAT 2016 would mean an overall 86.24 percentile. A scaled score of 95.43 marks in CAT 2016 would mean an overall 86.46 percentile. A scaled score of 95.63 marks in CAT 2016 would mean an overall 86.56 percentile. A scaled score of 95.72 marks in CAT 2016 would mean an overall 86.6 percentile. A scaled score of 95.88 marks in CAT 2016 would mean an overall 86.66 percentile. A scaled score of 95.89 marks in CAT 2016 would mean an overall 86.67 percentile. A scaled score of 96.79 marks in CAT 2016 would mean an overall 87.04 percentile. A scaled score of 96.87 marks in CAT 2016 would mean an overall 87.08 percentile. A scaled score of 96.95 marks in CAT 2016 would mean an overall 87.11 percentile. A scaled score of 97.01 marks in CAT 2016 would mean an overall 87.14 percentile. A scaled score of 98.08 marks in CAT 2016 would mean an overall 87.58 percentile. A scaled score of 98.43 marks in CAT 2016 would mean an overall 87.72 percentile. A scaled score of 98.77 marks in CAT 2016 would mean an overall 87.86 percentile. A scaled score of 99.31 marks in CAT 2016 would mean an overall 88.08 percentile. A scaled score of 99.7 marks in CAT 2016 would mean an overall 88.23 percentile. A scaled score of 99.87 marks in CAT 2016 would mean an overall 88.3 percentile. A scaled score of 100.08 marks in CAT 2016 would mean an overall 88.37 percentile. A scaled score of 100.17 marks in CAT 2016 would mean an overall 88.41 percentile. A scaled score of 100.47 marks in CAT 2016 would mean an overall 88.52 percentile. A scaled score of 100.67 marks in CAT 2016 would mean an overall 88.59 percentile. A scaled score of 100.7 marks in CAT 2016 would mean an overall 88.6 percentile. A scaled score of 101.19 marks in CAT 2016 would mean an overall 88.79 percentile. A scaled score of 101.31 marks in CAT 2016 would mean an overall 88.85 percentile. A scaled score of 101.49 marks in CAT 2016 would mean an overall 88.93 percentile. A scaled score of 101.63 marks in CAT 2016 would mean an overall 88.98 percentile. A scaled score of 102.05 marks in CAT 2016 would mean an overall 89.13 percentile. A scaled score of 102.28 marks in CAT 2016 would mean an overall 89.21 percentile. A scaled score of 102.27 marks in CAT 2016 would mean an overall 89.21 percentile. A scaled score of 102.36 marks in CAT 2016 would mean an overall 89.25 percentile. A scaled score of 102.61 marks in CAT 2016 would mean an overall 89.34 percentile. A scaled score of 103.04 marks in CAT 2016 would mean an overall 89.49 percentile. A scaled score of 103.42 marks in CAT 2016 would mean an overall 89.64 percentile. A scaled score of 104.44 marks in CAT 2016 would mean an overall 90 percentile. A scaled score of 104.47 marks in CAT 2016 would mean an overall 90.01 percentile. A scaled score of 104.9 marks in CAT 2016 would mean an overall 90.15 percentile. A scaled score of 105.86 marks in CAT 2016 would mean an overall 90.48 percentile. A scaled score of 106.05 marks in CAT 2016 would mean an overall 90.54 percentile. A scaled score of 106.35 marks in CAT 2016 would mean an overall 90.64 percentile. A scaled score of 107.13 marks in CAT 2016 would mean an overall 90.85 percentile. A scaled score of 107.43 marks in CAT 2016 would mean an overall 90.94 percentile. A scaled score of 107.54 marks in CAT 2016 would mean an overall 90.98 percentile. 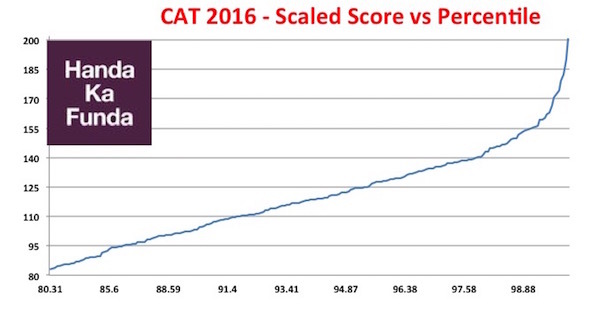 A scaled score of 108.19 marks in CAT 2016 would mean an overall 91.2 percentile. A scaled score of 108.31 marks in CAT 2016 would mean an overall 91.25 percentile. A scaled score of 108.53 marks in CAT 2016 would mean an overall 91.32 percentile. A scaled score of 108.81 marks in CAT 2016 would mean an overall 91.4 percentile. A scaled score of 109.33 marks in CAT 2016 would mean an overall 91.56 percentile. A scaled score of 109.35 marks in CAT 2016 would mean an overall 91.57 percentile. A scaled score of 109.5 marks in CAT 2016 would mean an overall 91.62 percentile. A scaled score of 109.88 marks in CAT 2016 would mean an overall 91.73 percentile. A scaled score of 110.23 marks in CAT 2016 would mean an overall 91.83 percentile. A scaled score of 110.25 marks in CAT 2016 would mean an overall 91.84 percentile. A scaled score of 110.35 marks in CAT 2016 would mean an overall 91.87 percentile. A scaled score of 110.42 marks in CAT 2016 would mean an overall 91.89 percentile. A scaled score of 110.83 marks in CAT 2016 would mean an overall 92.02 percentile. A scaled score of 111.05 marks in CAT 2016 would mean an overall 92.09 percentile. A scaled score of 111.07 marks in CAT 2016 would mean an overall 92.1 percentile. A scaled score of 111.19 marks in CAT 2016 would mean an overall 92.13 percentile. A scaled score of 111.37 marks in CAT 2016 would mean an overall 92.18 percentile. A scaled score of 111.75 marks in CAT 2016 would mean an overall 92.29 percentile. A scaled score of 112.18 marks in CAT 2016 would mean an overall 92.39 percentile. A scaled score of 112.99 marks in CAT 2016 would mean an overall 92.61 percentile. A scaled score of 113.11 marks in CAT 2016 would mean an overall 92.64 percentile. A scaled score of 113.9 marks in CAT 2016 would mean an overall 92.86 percentile. A scaled score of 113.94 marks in CAT 2016 would mean an overall 92.87 percentile. A scaled score of 114.16 marks in CAT 2016 would mean an overall 92.93 percentile. A scaled score of 114.75 marks in CAT 2016 would mean an overall 93.09 percentile. A scaled score of 115.04 marks in CAT 2016 would mean an overall 93.18 percentile. A scaled score of 115.38 marks in CAT 2016 would mean an overall 93.27 percentile. A scaled score of 115.63 marks in CAT 2016 would mean an overall 93.34 percentile. A scaled score of 115.92 marks in CAT 2016 would mean an overall 93.41 percentile. A scaled score of 115.94 marks in CAT 2016 would mean an overall 93.42 percentile. A scaled score of 116.61 marks in CAT 2016 would mean an overall 93.59 percentile. A scaled score of 116.71 marks in CAT 2016 would mean an overall 93.62 percentile. A scaled score of 116.76 marks in CAT 2016 would mean an overall 93.64 percentile. A scaled score of 117.44 marks in CAT 2016 would mean an overall 93.81 percentile. A scaled score of 117.85 marks in CAT 2016 would mean an overall 93.91 percentile. A scaled score of 118.17 marks in CAT 2016 would mean an overall 93.98 percentile. A scaled score of 118.41 marks in CAT 2016 would mean an overall 94.03 percentile. A scaled score of 118.46 marks in CAT 2016 would mean an overall 94.05 percentile. A scaled score of 118.81 marks in CAT 2016 would mean an overall 94.13 percentile. A scaled score of 118.86 marks in CAT 2016 would mean an overall 94.14 percentile. A scaled score of 119.15 marks in CAT 2016 would mean an overall 94.2 percentile. A scaled score of 119.14 marks in CAT 2016 would mean an overall 94.2 percentile. A scaled score of 119.54 marks in CAT 2016 would mean an overall 94.3 percentile. A scaled score of 119.73 marks in CAT 2016 would mean an overall 94.33 percentile. A scaled score of 120.39 marks in CAT 2016 would mean an overall 94.46 percentile. A scaled score of 120.75 marks in CAT 2016 would mean an overall 94.54 percentile. A scaled score of 120.98 marks in CAT 2016 would mean an overall 94.59 percentile. A scaled score of 121.07 marks in CAT 2016 would mean an overall 94.61 percentile. A scaled score of 121.28 marks in CAT 2016 would mean an overall 94.66 percentile. A scaled score of 122.08 marks in CAT 2016 would mean an overall 94.82 percentile. A scaled score of 122.29 marks in CAT 2016 would mean an overall 94.87 percentile. A scaled score of 122.3 marks in CAT 2016 would mean an overall 94.87 percentile. A scaled score of 122.61 marks in CAT 2016 would mean an overall 94.92 percentile. A scaled score of 123.36 marks in CAT 2016 would mean an overall 95.08 percentile. A scaled score of 124.22 marks in CAT 2016 would mean an overall 95.26 percentile. A scaled score of 124.26 marks in CAT 2016 would mean an overall 95.27 percentile. A scaled score of 124.28 marks in CAT 2016 would mean an overall 95.28 percentile. A scaled score of 124.42 marks in CAT 2016 would mean an overall 95.3 percentile. A scaled score of 124.6 marks in CAT 2016 would mean an overall 95.34 percentile. A scaled score of 125.04 marks in CAT 2016 would mean an overall 95.41 percentile. A scaled score of 125.21 marks in CAT 2016 would mean an overall 95.46 percentile. A scaled score of 126.76 marks in CAT 2016 would mean an overall 95.76 percentile. A scaled score of 127.36 marks in CAT 2016 would mean an overall 95.86 percentile. A scaled score of 127.52 marks in CAT 2016 would mean an overall 95.89 percentile. A scaled score of 127.73 marks in CAT 2016 would mean an overall 95.92 percentile. A scaled score of 127.86 marks in CAT 2016 would mean an overall 95.95 percentile. A scaled score of 127.97 marks in CAT 2016 would mean an overall 95.97 percentile. A scaled score of 128.23 marks in CAT 2016 would mean an overall 96.02 percentile. A scaled score of 128.62 marks in CAT 2016 would mean an overall 96.1 percentile. A scaled score of 128.88 marks in CAT 2016 would mean an overall 96.15 percentile. A scaled score of 129.02 marks in CAT 2016 would mean an overall 96.17 percentile. A scaled score of 129.35 marks in CAT 2016 would mean an overall 96.22 percentile. A scaled score of 129.66 marks in CAT 2016 would mean an overall 96.28 percentile. A scaled score of 129.95 marks in CAT 2016 would mean an overall 96.32 percentile. A scaled score of 130.3 marks in CAT 2016 would mean an overall 96.38 percentile. A scaled score of 131.29 marks in CAT 2016 would mean an overall 96.55 percentile. A scaled score of 131.72 marks in CAT 2016 would mean an overall 96.62 percentile. A scaled score of 131.94 marks in CAT 2016 would mean an overall 96.65 percentile. A scaled score of 132.2 marks in CAT 2016 would mean an overall 96.69 percentile. A scaled score of 132.58 marks in CAT 2016 would mean an overall 96.74 percentile. A scaled score of 132.92 marks in CAT 2016 would mean an overall 96.8 percentile. A scaled score of 133.01 marks in CAT 2016 would mean an overall 96.82 percentile. A scaled score of 133.66 marks in CAT 2016 would mean an overall 96.91 percentile. A scaled score of 134.01 marks in CAT 2016 would mean an overall 96.96 percentile. A scaled score of 134.27 marks in CAT 2016 would mean an overall 96.99 percentile. A scaled score of 134.6 marks in CAT 2016 would mean an overall 97.05 percentile. A scaled score of 135.35 marks in CAT 2016 would mean an overall 97.16 percentile. A scaled score of 135.4 marks in CAT 2016 would mean an overall 97.17 percentile. A scaled score of 135.42 marks in CAT 2016 would mean an overall 97.17 percentile. A scaled score of 135.63 marks in CAT 2016 would mean an overall 97.2 percentile. A scaled score of 136.04 marks in CAT 2016 would mean an overall 97.26 percentile. A scaled score of 137.15 marks in CAT 2016 would mean an overall 97.4 percentile. A scaled score of 137.19 marks in CAT 2016 would mean an overall 97.41 percentile. A scaled score of 137.3 marks in CAT 2016 would mean an overall 97.42 percentile. A scaled score of 137.67 marks in CAT 2016 would mean an overall 97.47 percentile. A scaled score of 137.74 marks in CAT 2016 would mean an overall 97.48 percentile. A scaled score of 138.16 marks in CAT 2016 would mean an overall 97.53 percentile. A scaled score of 138.54 marks in CAT 2016 would mean an overall 97.58 percentile. A scaled score of 138.56 marks in CAT 2016 would mean an overall 97.58 percentile. A scaled score of 139.03 marks in CAT 2016 would mean an overall 97.64 percentile. A scaled score of 139.36 marks in CAT 2016 would mean an overall 97.67 percentile. A scaled score of 139.87 marks in CAT 2016 would mean an overall 97.71 percentile. A scaled score of 140.46 marks in CAT 2016 would mean an overall 97.77 percentile. A scaled score of 140.38 marks in CAT 2016 would mean an overall 97.77 percentile. A scaled score of 141.07 marks in CAT 2016 would mean an overall 97.84 percentile. A scaled score of 142.83 marks in CAT 2016 would mean an overall 98.03 percentile. A scaled score of 143.13 marks in CAT 2016 would mean an overall 98.05 percentile. A scaled score of 144.78 marks in CAT 2016 would mean an overall 98.21 percentile. A scaled score of 144.82 marks in CAT 2016 would mean an overall 98.22 percentile. A scaled score of 145.27 marks in CAT 2016 would mean an overall 98.26 percentile. A scaled score of 145.87 marks in CAT 2016 would mean an overall 98.31 percentile. A scaled score of 145.92 marks in CAT 2016 would mean an overall 98.32 percentile. A scaled score of 146.44 marks in CAT 2016 would mean an overall 98.35 percentile. A scaled score of 146.82 marks in CAT 2016 would mean an overall 98.39 percentile. A scaled score of 147.07 marks in CAT 2016 would mean an overall 98.4 percentile. A scaled score of 148.57 marks in CAT 2016 would mean an overall 98.52 percentile. A scaled score of 149.44 marks in CAT 2016 would mean an overall 98.58 percentile. A scaled score of 149.67 marks in CAT 2016 would mean an overall 98.6 percentile. A scaled score of 151.62 marks in CAT 2016 would mean an overall 98.75 percentile. A scaled score of 152.51 marks in CAT 2016 would mean an overall 98.81 percentile. A scaled score of 153.54 marks in CAT 2016 would mean an overall 98.88 percentile. A scaled score of 153.77 marks in CAT 2016 would mean an overall 98.9 percentile. A scaled score of 154.44 marks in CAT 2016 would mean an overall 98.94 percentile. A scaled score of 154.72 marks in CAT 2016 would mean an overall 98.95 percentile. A scaled score of 155.24 marks in CAT 2016 would mean an overall 98.98 percentile. A scaled score of 155.85 marks in CAT 2016 would mean an overall 99.02 percentile. A scaled score of 156.05 marks in CAT 2016 would mean an overall 99.03 percentile. A scaled score of 159.24 marks in CAT 2016 would mean an overall 99.19 percentile. A scaled score of 159.4 marks in CAT 2016 would mean an overall 99.2 percentile. A scaled score of 160.02 marks in CAT 2016 would mean an overall 99.23 percentile. A scaled score of 162 marks in CAT 2016 would mean an overall 99.31 percentile. A scaled score of 163.14 marks in CAT 2016 would mean an overall 99.34 percentile. A scaled score of 166.49 marks in CAT 2016 would mean an overall 99.47 percentile. A scaled score of 170.65 marks in CAT 2016 would mean an overall 99.61 percentile. A scaled score of 172.54 marks in CAT 2016 would mean an overall 99.66 percentile. A scaled score of 174.34 marks in CAT 2016 would mean an overall 99.7 percentile. A scaled score of 179.2 marks in CAT 2016 would mean an overall 99.78 percentile. A scaled score of 182.19 marks in CAT 2016 would mean an overall 99.82 percentile. A scaled score of 190.04 marks in CAT 2016 would mean an overall 99.9 percentile. A scaled score of 200.49 marks in CAT 2016 would mean an overall 99.95 percentile. Please email your scorecard to [email protected] to make this list stronger and more detailed.